Beauty is something that each of us has whether we can see it or not. I was always told I am beautiful inside. However, I wanted to make my outside match my inside which is where my love of beauty was born. Many people who are visually impaired or legally blind may have the same issue. The beauty community online and in stores are not very accessible to those who have trouble seeing. This is where I came up with the idea to help make beauty accessible by teaching people how to use various affordable products whether they can see or not. I have a dream of making beauty accessible for everyone! I try to do that on my YouTube channel Blind Beauty. 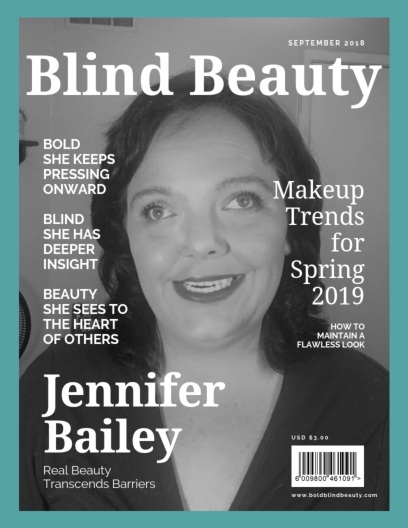 Featured image is a new faux fashion magazine cover titled Blind Beauty. Jennifer’s image on the cover is black & white. She’s looking fabulous in a v-neck top, with her makeup on and her shoulder-length dark hair frames her pretty face. In this color photo of Jennifer, she is smiling for the camera wearing a coral v-neck top.